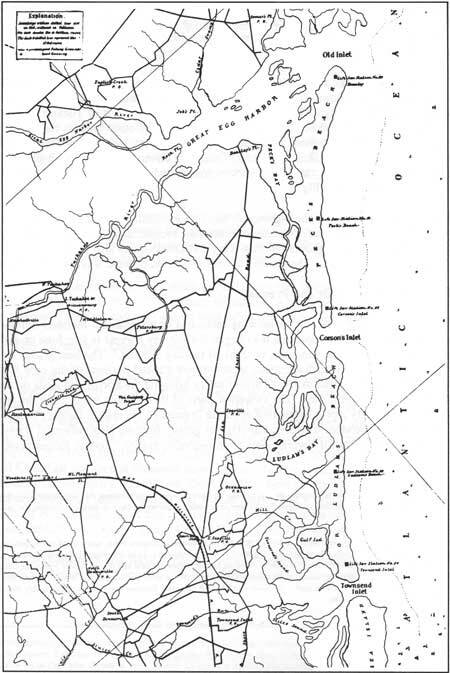 Though the Burcham farm is the last reclamation project of its type along the Maurice River, there is still some reclaimed land devoted to the production of salt hay along the Delaware Bay. In fact, the production of salt hay has become the current primary agricultural reason for preserving the reclaimed salt marsh. The Wetlands Act of 1970 bars the reclamation of new tracts of marshland, but does allow farmers to maintain what is already used for salt-hay production. Early Dutch and English settlers knew the value of this grass and harvested it as well as let their cattle graze on it. Jasper Danckaerts, a seventeenth-century Dutch traveler, described the salt-marsh meadows in New York and New Jersey as being mowed for hay even though at times it suffered tidal inundations. He observed that cattle preferred this salt marsh hay over fresh hay or grass. Adriaen van der Donck, a seventeenth-century resident of the New Netherlands, also commented on how sick cattle improved in health once set out on the marshes to graze. Even in the late nineteenth century, New Jersey commentators such as the Reverend Allen H. Brown discussed the vastness of the marshes along the Delaware Bay and the Atlantic Coast and the opportunities they provided. In addition to using nature to provide appropriate harvest times, farmers in the shore areas dug drainage ditches to eliminate mosquito-breeding places and increase the marsh's productive power by allowing better grades of salt hay such as black grass to grow. D. M. Nesbit in his report, Tide Marshes of the United States, gave reasons why reclamation projects were not as successful along the Atlantic Coast. Today only a handful of farmers along the Delaware Bay and several along the Atlantic Coast take advantage of this natural crop. The modern techniques used to harvest the hay, as well as the farmers' memories of past procedures, add an interesting chapter to New Jersey's agricultural history. Despite mechanization, many of the principles behind the modern harvest of salt hay are the same as they were during the colonial period. In some instances, the principles have been handed down to members of each generation. In the case of Ed and Lehma Gibson, salt-hay farmers in Port Norris, the business was passed to them by Lehma's father, Austin Berry, who inherited it from his father, Leaming Berry. Salt-hay cutting has been in the Campbell family for several generations: George Campbell of Eldora inherited his meadows from his father, Stewart Campbell. Both the Gibsons and Campbell cut several thousand acres a year. Today, other Delaware Bay commercial farmers include Clarence Berry and his son, Dean, of Port Norris; Franklin Garrison of Dividing Creek; Michael Coombs, Preston Durham and Wayne Durham of Fairton; Marshall Hand of Goshen; and Ezra Cox of Heislerville. Most hay is harvested from marshes directly on the Delaware Bay and its tributaries, the Cohansey River, Sluice Creek, East Creek, and Goshen Creek. Figure 25. 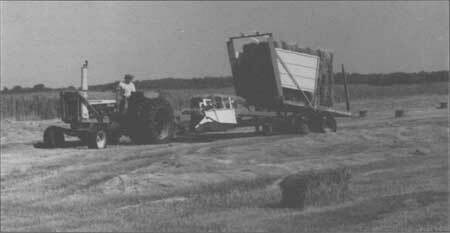 Until the 1950s, salt hay was loaded onto wagons via pitchfork. Gibson's Private Collection. Henry Hayes, a resident of Port Norris and an employee of Stewart and George Campbell as well as Leaming and Austin Berry, added to Campbell's description of the harvesting process. Hayes explained that harvesting salt hay was a twelve-hour-a-day job that started at 6 A.M. and ended at 6 P.M.; his first employers paid him $1 a day with a bonus at Christmas. Hayes's season with the salt-hay farmers began in the middle of June and lasted into October, when he went to work in the shucking houses or on an oyster boat. If the bay froze and the oyster schooners could not get out, he returned to help whichever salt-hay farmer had a job for him. Preparing the horses for work marked the beginning of Hayes's day. At the meadow they either pulled mowing machines or wagons; at the time, the mower was the only piece of machinery used in the field. The hardest part of working with horses, according to Hayes, was making sure the meadow had a "good bottom," or was solid ground. Horses wore special footwear: wood, leather, or iron mud-boots strapped or buckled to their hoofs that kept them from sinking (Fig. 26). Figure 26. 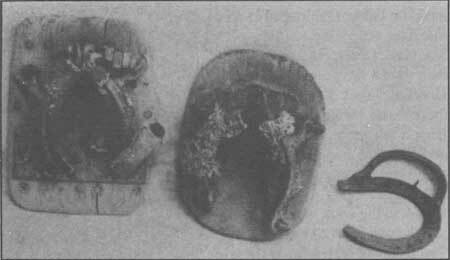 Shoes such as these were worn by horses that worked on the meadows. Early Industries. Figure 27. 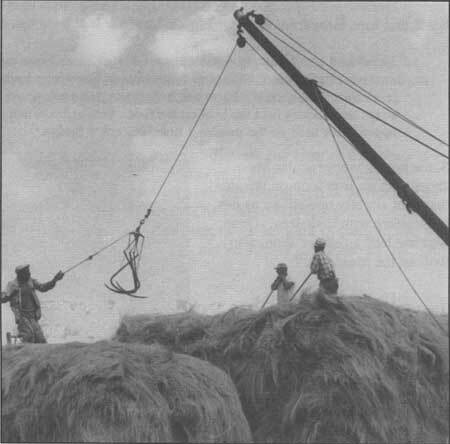 Hay was unloaded from wagons via a swingboom and grapple hook. Gibson's Private Collection. Hayes also remembered loading hay onto scows at Florida and Ware creeks. He disliked this method of transportation because it required leaving the bayside around 4 P.M. and not arriving to the Dividing Creek Bridge until 11 P.M. Removing hay from the meadow by wagon, to trucks, then to railroad cars in Port Norris or Dividing Creek took less time; Leaming and Austin Berry often used this method. Once the bales were made, workers weighed and tagged them. Lehma Gibson described how her mother would take the tags off the bales as they were loaded on a truck en route to market, adding them up to determine the cost of each load of salt hay. 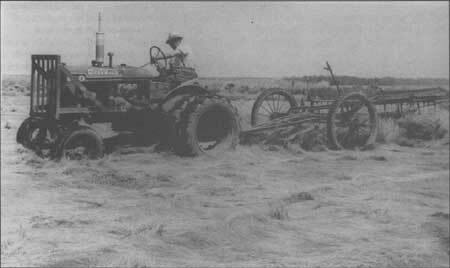 By the late 1940s, tractors had replaced horses except where the ground was extremely soft. Campbell described it as a "big event in our lives" when he bought his first International F-12 with steel wheels. The Farmall A tractor replaced most of Stewart Campbell's horses because it was light enough to stay suspended on most meadows. By the 1940s, Austin Berry was fitting his tractors with dual rear wheels to keep them from sinking (Fig. 28). Figure 28. Austin Berry raking salt hay in the 1940s. Notice the dual rear tires on the tractor. Gibson's Private Collection. Figure 29. During the 1950s, balers were introduced to the salt-hay industry. Gibson's Private Collection. Figure 30. Skids are placed underneath of modern equipment to prevent them from sinking below their axles if a soft spot is encountered. Sebold. 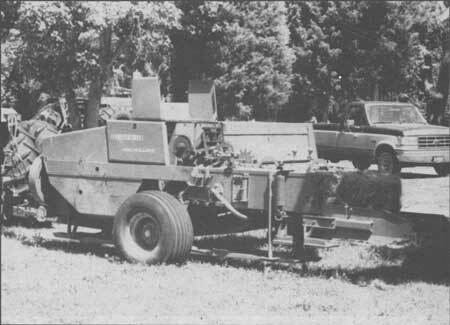 Today, Gibson and Campbell use a variety of upland equipment, including tractors, propelled mowers (that mow and rake simultaneously), hay balers, and wagons with automatic loaders (Fig. 31). The farmers build supporting skids on all of the upland equipment with the exception of tractors with dual wheels and flotation tires. Moreover, Gibson now loads his hay with a fork lift onto tractor-trailers to be taken to the buyers. Figure 31. Chris Angelo, the Gibson's grandson, drives an automatic bale wagon on the marsh to collect the bales of hay. Sebold. Age-old problems such as muskrats, fiddler crabs, horseshoe crabs, and storms continue to disrupt salt-hay farming today, because they harm the protective banks that keep tidewaters off the meadow. Muskrats and fiddler crabs burrow into the banks, for instance, and cause breaches. Hayes commented on his experience repairing the banks. Along the Atlantic coast farmers watched for muskrat holes, which could cause a horse to break a leg if the animal stepped into it. Fiddler crabs and horseshoe crabs also undermine the support system of the man-made banks by cutting away at natural stream banks. As the banks erode, the creeks widen, making it harder for salt-hay farmers to get across. Campbell described such a problem at Dennis Creek. Today, most salt hay is shipped to buyers in New England, Pennsylvania, and northern New Jersey for use at nurseries, in road construction, and as septic-tank insulation. Nurserymen favor it as a mulch because the seeds cannot adapt to upland conditions, making it virtually weedless. 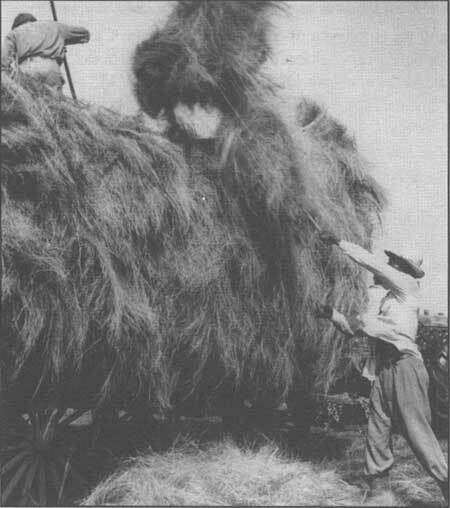 Hay was also used, and still is to a lesser extent, to make salt-hay rope which, like the harvest of salt hay in general, has become a South Jersey tradition. Owen "Jack" Carney, Jr., a Port Norris resident, learned to make salt-hay rope from his father who established a rope factory in Port Norris in 1907 for a Philadelphia iron-foundry supply firm (Fig. 32). 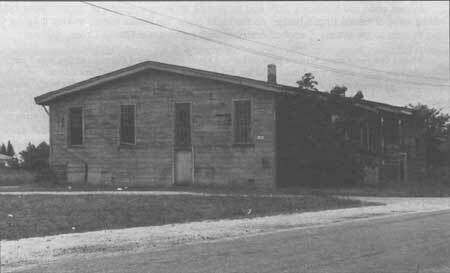 Located on Memorial Avenue next to the baseball field, there were always thirty-five or forty stacks of hay outside of the factory awaiting processing. The building included both a storage area for finished rope as well as the work area. Figure 32. This salt-hay rope factory, operated by Owen J. Carney, Sr., was located on Memorial Avenue in Port Norris, New Jersey. Photograph 1963, Riggs' Private Collection. Figure 33. 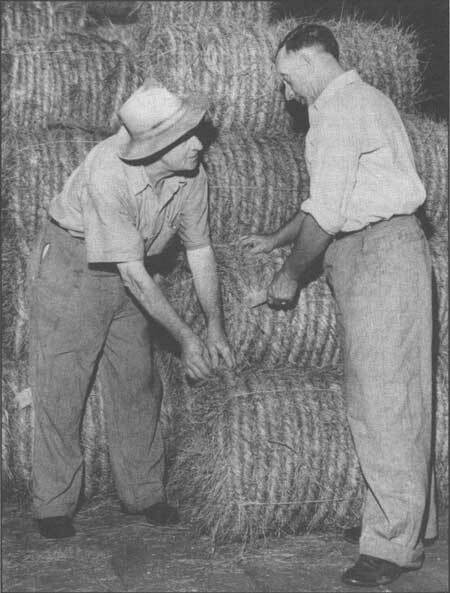 Owen J. Carney, Sr. (left) and Austin Berry (right) discuss Carney's spools of salt-hay rope. Gibson's Private Collection. During the eighteenth, nineteenth and twentieth centuries, salt hay was not the only crop grown on reclaimed land. Many farmers planted regular upland crops. These growers, however, risked the fields being inundated by salty or brackish water, which killed the upland crops and damage salt hay. As a result, some farmers worked together and formed meadow companies, to ensure that the banks remained intact for successful harvest of cropswhether salt hay, clover, corn, or potatoes. With time and changing technology however, these traditions are dwindling.